We’ve now reached the end of the Hywel Dda Health Board’s consultation on service reconfiguration. I hope you made your views known to Hywel Dda. I know I did. I support the Health Board’s aspiration to redirect services out of acute hospitals and into homes and communities. Fewer un-necessary hospital admissions, shorter hospital stays and good re-ablement services in the community would be very welcome. However, making this shift is not cheap and requires better integration between GP and hospital care. In the current round of Health Board reconfiguration proposals, I’m not convinced that there is sufficient money to make the changes necessary whilst retaining other aspects of the NHS. In Ceredigion, I want to see excellent GP and community services. We need now to be planning for young GPs into our practices. I want to see our brightest schoolchildren supported financially through their studies and contacted to work in return for a set period for the NHS in Ceredigion. This kind of proactive workforce planning is necessary across the NHS, in order to avoid recruitment problems in the future. Patients in Ceredigion are served by Bronglais and Glangwili, and to a lesser extend by Withybush. Specialist cardiac, cancer and other services are provided for us at the Heath, Morriston and Singleton. We need all these hospitals to be modern, clean, well-staffed establishments. Some of the arguments for the retention of life-saving consultant-delivered services at Bronglais have been won, following the well-attended, loud and colourful protest on the steps of the Senedd, Cardiff Bay, earlier this year. However, we need to keep a particular eye on retaining a consultant-delivered, full A&E at Bronglais and I need to carry on campaigning for investment to upgrade the theatres from the Welsh Government. Another crucial part of the jigsaw is our community hospitals. All three will be closed by the Health Board in their current locations. A new hospital and GP complex is to be built in Cardigan on the Bathhouse site, and the land has now, finally, been bought by the Health Board. 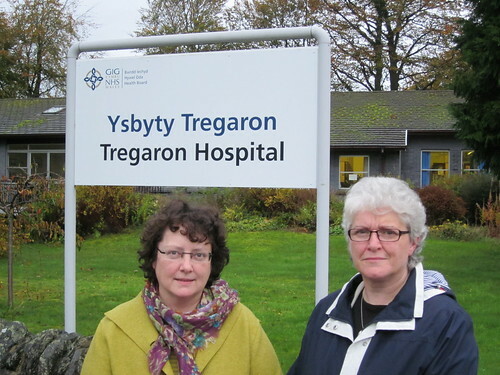 In Aberaeron, a new GP and outpatient facility will replace the current hospital building, and in Tregaron a new housing, hospital and residential care complex – known as Cylch Caron –is planned. We now need to see renewed vigour from the Health Board, the County Council and Welsh Government to start building these long-awaited projects. In these times of Westminster funding cuts, there’s not as much money around and these three projects need to be at the front of the queue so that we can see improved services for Ceredigion.